The indoor arena is open year-round & includes a spacious lobby, full-service pro shop, skate rental, locker rooms, meeting rooms, family changing room, referee room and bleacher seating for 500. 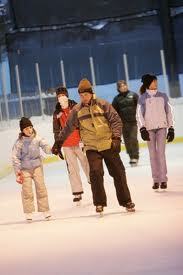 The outdoor rink is open from mid-October through March has an indoor warming facility, complete with locker rooms. In the summer, the outdoor rink becomes a covered turf field. The Ice Arena hosts many groups and activities, including daily public skating sessions, drop-in hockey, youth & adult hockey leagues and a variety of ice skating classes.